Region 9 Education Service Center Adult Education and Literacy are having their last High School Equivalency (HSE was formally known as GED) orientation for the 2018-2019 Adult Education and Literacy year. It is to be held April 1st & 2nd, 2019 from 9:00A.M.-12:00P.M. (Day Classes) or 6:00P.M. – 9:00P.M. (Night classes). Advising will be on April 3rd by appointment. Students are required to attend ALL DAYS OF ORIENTATION, no exceptions. PRE-REGISTRATION IS REQUIRED. 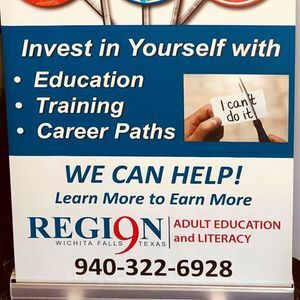 YOU MUST CALL ADULT EDUCATION AND LITERACY AT 940-322-6928 AND MAKE AN APPOINTMENT TO PRE-REGISTER. Location for Pre-Registration and Orientation will be Region 9 Education Service Center, 301 Loop 11. Students must attend pre-registration and orientation to be eligible for classes. Please bring a picture I.D., Social Security card, pencil and paper. If you have any questions, please call the Adult Education and Literacy Department at Region 9 Education Service Center (940) 322-6928. *Students who are 16-19 years old will need to bring completed eligibility form, withdraw form from their last school and parent to the registration appointment.